Schematic representation of Notch signaling in neural crest cells that differentiate into VSMCs within the aortic arch during embryonic development. Notch receptors are transmembrane proteins that can transduce cell-cell interactions into cell fate determinations. Upon the binding of Notch to a ligand such as Jagged or Delta, the Notch carboxyterminal fragment is cleaved between Gly1743 and Val1744 by a γ-secretase. The cleaved intracellular domain translocates to the nucleus to form a heterocomplex with the transcription factor RBP-Jκ and coactivators such as MAML, resulting in transactivation of target effector genes (e.g., HES and HERP). The study by High et al. 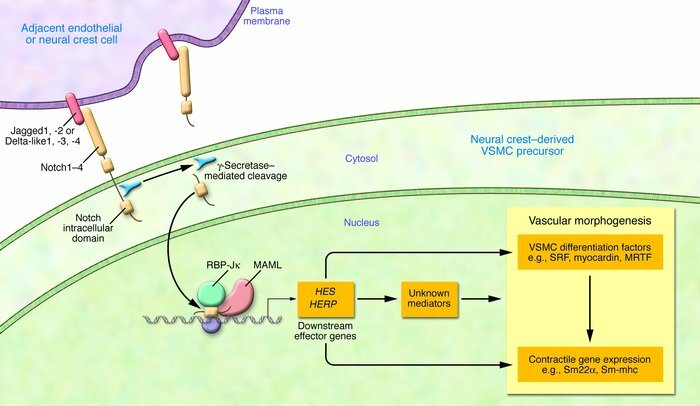 (6) in this issue of the JCI supports the model illustrated in this schema in which cell contact may occur between adjacent endothelial or neural crest cells to initiate VSMC lineage commitment through Notch-induced lateral specification. Downstream activation of target genes results in SMC lineage commitment by: (a) activation of known “master regulators” of VSMC differentiation (e.g., myocardin, myocardin-related transcription factors [MRTFs], or serum response factor [SRF]); (b) direct activation of contractile protein expression (e.g., smooth muscle myosin heavy chain [Sm-mhc]); or (c) activation of unknown effectors that can transactivate expression of genes in scenarios a and b (19, 20). Sm22α, smooth muscle protein 22–α.